What is included in the Miscellaneous Section? Anything which does not fit into any of the other categories. 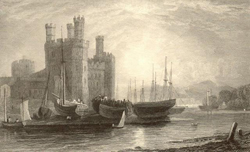 For example a translation of the relevant genealogical sections of the 1861 local history book "Hanes Sir a Thref Caernarfon" from the original Welsh. The book was written by local Schoolmaster & Councillor, John Wynne, and published by Hugh Humphreys of Paternoster Buildings, Castle Square. Readers who are not familiar with the town are recommended to have a look at "A Description of Carnarvon 1809 -1811," "The Town Through Guide Books," and "Maps of Carnarvonshire." Below are articles written by Emrys Llewelyn, who has kindly allowed them to be reproduced here. Emrys provides walking tours around the town. Each article will appear in both Welsh and English. The Welsh language versions originally appeared in Emrys's book Stagio Dre, published by Y Lolfa in 2013.